The U1, from Warschauerstrasse to Uhlandstrasse, is the oldest underground line in Berlin. It takes you through years of history in a short ride. Starting East, at Warschauerstrasse Station, after having strolled through the Eastside gallery, the line crosses the river, previously a division between east and west Berlin, over Oberbaumbrucke. 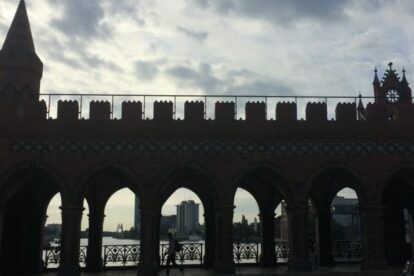 On a clear day you can catch breathtaking views of the Spree. Schlesisches Tor, your next station, drops you right smack in the middle of Kreuzberg’s most colorful areas, filled with restaurants, clubs, shops and just a few steps away from the bridge. You could walk or ride over to Gorlitzer Bahnhof and Kotti, admiring what’s left of the impressive building grafitti. You have Hallesches Haus a few stops down if you want a bite to eat, or Gleisdreieck Park if the day calls for a picnic. If you go further you may sense the slight change of architecture in the next few stations, the real old West Berlin, still holding an air of the golden twenties and still filled with jewels of the time, like Diener Tattersal. Get off at Wittenberg Platz and do some shopping at KaDeWe. Or walk further down toward Uhlandstrasse and get lost in side streets flanked with cafes leading over to Sauvigny Platz. It’s filled with possibilities really, and depending on the day you can ride it or stroll along it, taking in every-day-Berliner life and years of history within it.